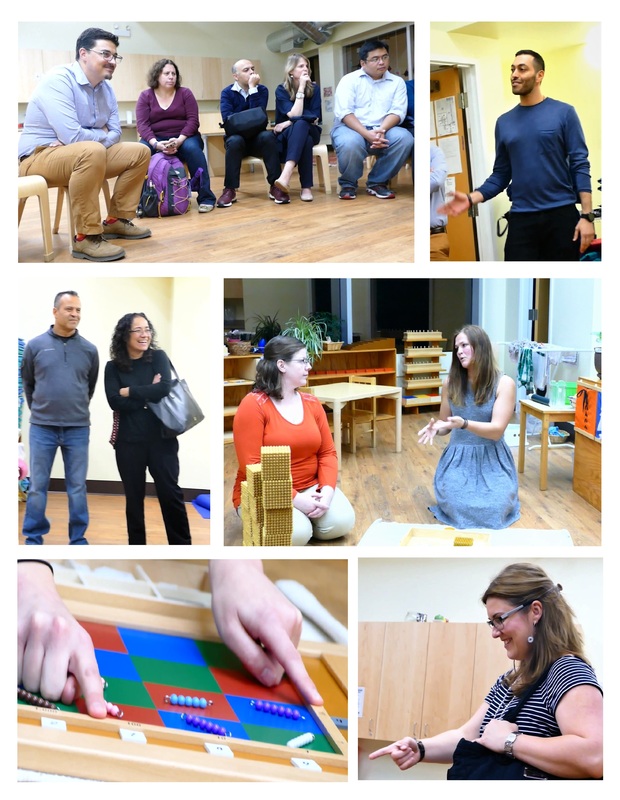 In early October, South Loop Montessori School welcomed more than 60 parents to its Montessori Journey Night. The event provided an opportunity to watch lead teachers give Montessori presentations on lessons that connect and evolve through student experiences as they advance through the different classrooms and age groups — from Infant all the way through Elementary. Parents roamed the hallways of our recently renovated facility and learned about elements of each classroom. The Montessori Journey was also a time for parents to see the Montessori materials that children use every day and gain a deeper understanding of them and how they support the Montessori Method. Following is a recap of the lessons learned on this journey through each classroom and key takeaways from each program. The journey for parents began in the Infant classroom, where the community focuses on giving children the opportunity to explore their surroundings in an environment speciﬁcally designed to ﬁt their developmental needs. Through our group and individual activities, we support infants with their emotional, cognitive, and physical growth. Parents learned how we promote conﬁdence, independence, social participation and feelings of belonging as well as caring for oneself and the surrounding environment. 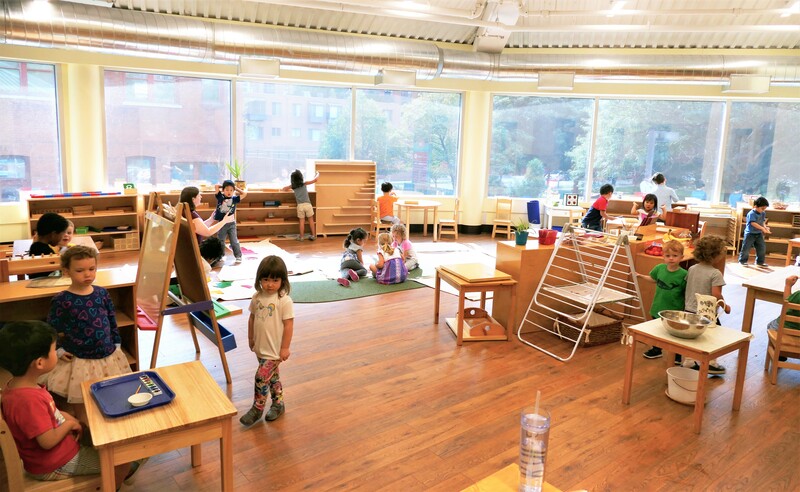 This nurturing environment has age appropriate furniture as well as open space for movement. The room has speciﬁc materials in place that require hand and full body manipulation and movement. Each material in this classroom sets up the infants to transition into the Toddler environment. Infancy is the foundation for everything that follows through a child’s Montessori journey, as well as life in general. Parents then journeyed next-door to the Toddler classroom, which focuses on developing the child’s innate sense of wonder, curiosity, motor skills, self-esteem, social skills, emerging language, and cognitive processes. We promote independence, conﬁdence, grace and courtesy for one another, caring of the self and respect for the environment. Time is spent carefully preparing a rich learning environment that also provides the opportunity for the children to explore. The toddler classroom allows for this free exploration and learning in uninterrupted work periods. Additionally, this environment is individual focused, and pays attention to how each child learns and goes through each stage at his or her own pace. Our toddler community has age appropriate furniture as well as an open space for movement. Most of the materials are designed in such a way that children can teach themselves by working with the materials independently. Therefore, the teacher’s role is to facilitate the children’s interaction with the materials (if needed). Montessori materials are naturally enticing to children; although if a child cannot choose an activity, the teacher is trained to suggest one that will interest him or her. Once a child is happily working, the teacher steps back and allows him or her to work as long as he or she likes, without interruption. If a child desires help, the teacher provides needed assistance. Next Stop Pre-Primary Classroom Parent groups made their way upstairs into the Pre-Primary classroom where they observed presentations, watched a video and learned about the Montessori Work Cycle. One of the most important parts of your student’s school day is the morning work cycle. During this two- to three-hour period, we see the most intellectual growth as students are allowed to concentrate deeply in order to follow their curiosities and choose work freely. This is also when teachers observe them best to guide their learning and assess their progress. Sensorial “Educating the Senses” — Our sensorimotor materials allow the children to develop a deeper awareness of their world by isolating their sense of touch, taste, sight, smell, and hearing. Language — This is a major sensitive period for language. At this level, your child is in their sensitive period for speaking and communicating. In this environment, we guide their development by speaking in clear, intellectual sentences to help develop a rich language so that the child is able to clearly communicate their needs. Mathematics — We work on developing abstract Mathematical concept through our sensory materials. The concepts will lay the foundation to prepare them for Primary. The Primary classroom across the hall was next on the journey. Parents learned how this age group (3 to 6) allows children to grow their independence while using problem solving skills and persistence to complete tasks. As the environment provides free choice within a set of community boundaries, the child is able to reach independence. At this time, the child is emerging as a social being and is learning how to be a part of a group; how to take care of others, themselves, and how to take responsibility for the environment. With peace as a guide, the child learns how to navigate disagreements with grace and assertiveness. The child at this stage is also developing into the man or woman he or she will become. Practical Life — The focal points of this area are to develop the child’s sense concentration, coordination, independence and order while developing ﬁne and gross motor skills. Language — The language materials are designed to develop listening, speaking, writing and reading abilities. Each material follows a speciﬁc sequence and presentation in order to best prepare the child. Mathematics — The math materials are designed to help a child understand mathematical concepts concretely before moving towards abstraction. Science — This area is designed to allow children to explore and experience the natural world around them while learning basic concepts that will be used in future learning. Cultural — Earth is a vast and diverse planet and the cultural curriculum is used to expose children to diﬀerent peoples, places, and creatures. The primary classes focus on one continent at a time, looking at the animals, people, geography and customs. The Elementary classroom builds on the foundation that your child has built in the Primary classroom. On the journey, parents took notice of the similar appearance to the Primary classroom (ordered shelves; everything has a place; beauty in materials). The Elementary classroom is composed of eight subject areas: mathematics, language, geometry, geography, biology, history, art and music. With limited time in a tour setting, the presentation focused on the connection of math and practical life. Parents learned that the skills an Elementary student builds in practical life (i.e. independence, concentration, ability to follow a sequence, an ordered mind) prepare them for math work. Children at this age need to have the ability to concentrate for long math lessons and the ability to work independently, which is why Montessori materials become so helpful in assisting them. Through repeated use of the materials, the child forms a mental picture in his or her mind that allows them to move towards abstracting a concept. On this last stop in the evening, parents observed a demonstration with the checkerboard, one of several math materials that assist your child with understanding long multiplication. The checkerboard materializes the multiplication algorithm. It is a “birds-eye view” of the process. A key takeaway from the classroom was seeing how Montessori supports the emerging student as they enter new developmental phases filled with wonder, interest, and active enthusiasm. By sparking imagination and following students’ passion, our teachers create an environment that allows children to thrive academically, as well as develop a sense of belonging in the community. Eagerness to learn, learning for the joy of learning and wanting to know as much about their world as possible is what we believe are invaluable qualities that we can instill in our children. The parent event concluded at the Elementary classroom, but the Montessori Journey continues every day for our students and parents. Together, we will carry out our philosophy which is rooted in the Montessori Method. It’s our way of life and we encourage everyone to learn more about the philosophy and its accompanying methodology that provides the necessary ingredients that meet and exceed academic, social, emotional, spiritual, and academic challenges of early childhood. Please click through our links to learn more about the Montessori Method or our Core Curriculum. We look forward to hosting more events for parents in the near future. © 2019 South Loop Montessori. All Rights Reserved.